We are able to assess and remove very involved cases of troubled wisdom teeth. Wisdom teeth are the third molar teeth that usually come through between 17 and 25 years of age and are generally the last teeth to erupt. More and more of these teeth are not able to fit within the dental arches due to space problems. However just the fact that they do not fit is not reason enough for them to be removed. Crowding of teeth has largely been proven to not be caused by the impacted wisdom teeth although both are often found together. We would suggest that the cause for both the crowding and the too little space for the wisdom teeth are due to the too small size of the jaw. Some other reasons may also be included and the risks and benefits for treatment will be assessed in every case. The decision to remove your wisdom teeth can be complex so it’s best to talk to a dentist about your situation. If a decision is made not to remove your wisdom teeth, they should still be monitored periodically due to the risk of developing complications and problems later on. To assess if you need your wisdom teeth taken out, visit us at Lake View Dental. Call our skilled team today on ph. (07) 5437 7888 or click here. 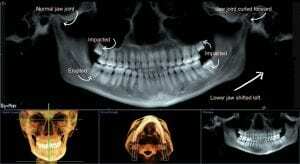 Why are wisdom teeth such a problem? A popular belief amongst clinicians, anthropologists and the general public is that wisdom teeth are a holdover to our ancestor’s rough diet. These foods required more chewing power that resulted in more friction in-between the teeth and resulted in more wear. However, it has been discovered that as little as 400 to 700 years ago, almost all jaws were able to accommodate all teeth (including wisdom teeth) and even had some space. These jaws had a lot of wear on the chewing surfaces (due to hard diet) and limited in-between wear, yet there was a lot of space for all the teeth to fit comfortably and even space behind the wisdom teeth! In evolutionary terms, 700 years are too short for that kind of genetic change and is more likely due to epigenetics. Today’s modern diet of softer foods and the invention of utensils like knives and forks have made jaws smaller than our immediate ancestors. However, the fact that the teeth do not fit is also an indication that something else is wrong and has been shown to be the result of narrow and short dental arches. This epigenetics and not genetics principle relates to our modern day environment overriding the DNA. The tooth buds generally develop parallel to the surface of the bone that it is intended to erupt into and with enough space to the back of the second molar the tooth bud develops generally upright. With too little space the tooth bud is forced further back into the upward angled part of the jaw. This can often result in eruption at odd angles and may be partially or fully impacted. We would like to get to our patients a little earlier in their life when the jaw is still developing before the wisdom teeth start to grow and cause potential problems. As the smaller jaw size may also cause crowding problems and downward and back positioned tongue and the related problems this cause, we like to intervene early enough to try and circumvent all these potential future problems. For further information on the potential future risks to small jaws, visit our Ortho for Health page. The above X-ray is an example of what we are saying. This patient started out with a too small upper jaw but somehow the lower jaw growth was not restricted by the top jaw and grew to the genetic potential. However, with the mismatch of the lower jaw to the upper jaw with the lower jaw bigger and not being able to fit into the top jaw, the patient developed a shift of the lower jaw to the left side (unilateral crossbite). The patient was treated orthodontically at another practice and the teeth were aligned without the alignment of the jaws. The patient had severe TMJ pain but the point we want to make is that the right-hand side where the lower jaw was not restricted the wisdom tooth developed and erupted normally. However, with the top jaw being smaller than genetic potential the resulted space problems caused the top wisdom teeth impaction. The shift of the jaw to the left and back resulted in the left TMJ jaw joint to curl forward due to the backward pressure and the change in the jaw length on the left side. This shorter jaw length on the left side resulted in the impaction of that side wisdom tooth. Most patients we see however have this situation on both sides of the jaw but because they have it both sides the cause can often be overlooked. That is why this case is so important to illustrate the problem. To find out more, contact Lake View Dental and book your appointment with Dr Ian. Please fill in the online enquiry form to ask a question or book your appointment. Our experienced team are equipped with the resources to offer the complete spectrum of dental care.